Totally agree with you that losing has more fear and emotion attached than winning. This is the typical gambler where sometimes they bet as they get a rush from the fear of losing. Then you look at penalty shoot outs in soccer matches ( football over here (:- ) how many times do you see great players miss them under pressure. So when it comes to golf I am very interested in your statistics and this is why. Golf is a mental game and I play off 5 which is pretty good. Putting is the hardest thing to do in golf as the club needs to be taken away smoothly which most golfers find hard to do. 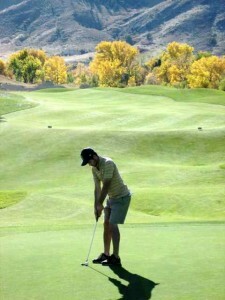 On short putts whether for birdies or par I use NLP what I do after lining up the put is to try to relax. Loosen the grip , breath slowly and then just before I hit the ball I switch my mind off by thinking of a boat on the water sailing down the river. Then I hear the ball hit the cup and I pick it our of the hole. So I am not even thinking this is for a par or birdie as I am switching the one thing off that you have to when putting , the conscious mind. On long putts you are never trying to hole them just trying to get the line and the pace. In my mind I see the hole as I watch the club hit the ball. NLP again.